After spending two days at disney parks, we decided to take a break at clearwater beach (about 90 miles away from Orlando). 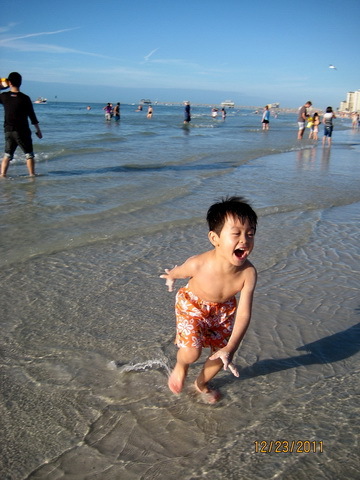 We relaxed at the beach enjoying sunshine, with my girl friend, Jing, and her two boys. Jing and I knew each other at graduate school, 2002. Time flies, 9 years later, we all become proud moms. Although we never stay at a same city in the past 8 years, we scheduled reunion almost once a year (unless one of us was pregnant, lol). Well, it certainly gives us an extra excuse to have a vacation. i followed you from wxc and read almost all your fashion blogs which I enjoyed very much. frankly speaking, i am not big fan for big brands and don't quite like your early style and even thought you as a slave of big names.but with time passed, you made much progress by settling down with several suitable brands.look at you now, so elegant and gorgeous! like to share some thoughts some time.